The Battle of Kursk was a decisive Soviet victory against the Germans in the Second World War, lasting between July 5th and August 23rd 1943. It is remembered as being an intensive tank battle, earning the reputation of being the ‘greatest tank battle’ in military history. It began as a German offensive under the codename Operation Citadel, which was met by two Soviet counter-offensives. The Germans planned the offensive to alleviate the pressure on the Eastern front by retaking the Kursk salient and using captured citizens for labour in order to progress the German war effort. After the devastating blow at Stalingrad, the Germans also felt the need to reassert their strength on the European stage. The Red Army received intelligence regarding the offensive from the British, altering them to the planned attack. The Germans were also delayed in starting the offensive, waiting for prime weather conditions, and for the latest tank models to be completed (Lanning 2005: 160). These two factors allowed the Soviets to adequately prepare for battle, and create defensive lines throughout Kursk; “the delay may have strengthened the German attack force, but it helped the Russian defenders even more” (Lanning, 2005: 160). The battle marked the first strategic summer offensive for the Red Army, breaking the pattern of the war: “as summer 1943 approached, the reality seemed to be that the Germans owned the summer and the Red Army the winter” (Glantz and Orenstein, 1999: xiii). Rearmament and reproduction had accelerated for Germans in 1942 and 1943, so the Wehrmacht and Luftwaffe well equipped for the battle. At this point, much to Stalin’s frustration, the Allies had not yet engaged the Germans in a Western Front, so the Germans only had one Front on which they needed to focus their attentions. In the summer of 1943, two-thirds of German troops were positioned somewhere on the Eastern Front. The region of Kursk was a Soviet salient. It created a bulge in the Eastern Front, stretching 150 miles between the north and the south. (Lanning, 2005: 160). It posed a threat to the Germans, since their soldiers were in danger of being trapped in the salient if a sudden pincer stack was staged by the Soviets. Kharkov (now Kharkiv) and Belgogrod – regions within the Kursk salient – had been recaptured by the Germans in March 1943 after Soviet liberation in February 1943, and the Germans were keen to regain the territory. “Every commander, every private soldier, must be indoctrinated with awareness of the decisive importance of this offensive. Victory at Kursk will be a beacon for the whole world.” (In Lanning, 2005: 160). Prior to the attack on the Kursk salient, 900,000 German troops had been assembled in the region. Approximately one-third of the entire German military was poised there ready for battle. The Soviets planned to fight defensively initially, in order to let the Germans expend all their energy and tire themselves out. The Red Army had reserves placed at the rear of their formations, ready to stage a counter-attack. The region had been prepared with anti-tank defences, such as 400,000 mines and trenches dug specially for the battle. Citizens helped repair some 1,800 miles of road before the battle began. By July 1943, the Soviets had positioned 1.3 million soldiers, 3,600 tanks, and 2,400 planes within the salient. The Soviets captured some German prisoners before the battle began, who told the Red Army that Operation Citadel was due to start on July 5th. The Soviets launched an artillery attack at 0200 that day, shocking the unsuspecting German troops. This revealed to the Germans that their plan had been foiled. The Germans waited for air cover before starting a tank attack at 0530; they gained six miles in the first day of battle but lost 25,000 men, 200 tanks, and 200 aircraft in the process. July 12th saw the major tank battle at Prokhorovka, which involved over 1,500 tanks. The Germans lost 350 tanks and 10,000 men over the course of the day. The Soviets started a counter-attack, and by July 23rd, the Germans had been pushed back to their starting point. Another counter-attack was begun by the Soviets in the north of the region on July 12th, which drove the Red Army forward 45 miles by July 19th. The German trains were attacked relentlessly by the Soviet Air Force, destroying the German morale. The Soviet counter-attack in the south of the salient began on August 3rd, pitting 1 million Soviets against 300,000 Germans. The Soviets recaptured Belgogrod on August 5th, and on August 23rd, Kharkov was liberated, bringing an end to the Battle of Kursk. The Battle of Kursk was the last major offensive launched by Germany in Soviet territory. 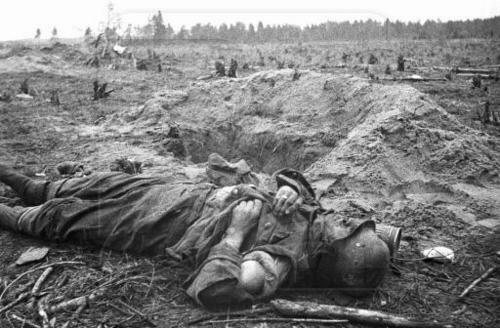 Over the course of the battle, some 500,000 German troops were killed. Stalin famously remarked that “if the Battle of Stalingrad signalled the twilight of the German-Fascist army, then the Battle of Kursk confronted it with catastrophe” (Glantz and Orenstein, 1999: xvii). The German army never recovered, and were pushed further and further west out of the USSR, until the Soviet and Allied forces reached Berlin in May 1945. “These three immense battles of Kursk, Orel and Kharkov, all within the space of two months, marked the ruin of Germany on the Eastern Front.”Winston Churchill (in Clark, 2011: 404). David Glantz and Harold Orenstein, 1999, The Battle for Kursk, 1943: the Soviet General Staff Study. London: Frank Cass Publishers. Michael Lanning, 2005, Battle 100: the Stories Behind History’s Most Influential Battles. Illinois: Sourcebooks Inc.
Lloyd Clark, 2011, Kursk: The Greatest Battle. London: Headline Publishing Group.